It's really hard to believe that Tony Hatch would actually describe his song "Sugar and Spice" as "banal." Yes, he's written a lot of classic hits, but "Sugar and Spice" -- as arranged and performed by the Cryan Shames -- has to be one of most perfect portraits-in-sound of the euphoria of young love. It works musically, lyrically and as a timeless recorded performance. I've always liked The Searchers ("Don't Throw Your Love Away," "Needles and Pins," "Love Potion #9," etc.) but have also always felt that their original version of "Sugar and Spice" sounds uninspired, like a routine demo. In contrast, The Cryan Shames added passion, propulsion and a surge of unbridled joy that transformed the song into a pure romantic rush. Female equivalents: The Crystals' "Da Doo Ron Ron" and Dusty Springfield's "I Only Want To Be With You." Had The Cryan Shames' version only been released on a major label with good distribution (rather than tiny Destination) in 1966, I'll bet it would have gone #1. As it was, the single (despite limited distribution) did well enough to land the group a deal with one of the majors, but unfortunately it was Columbia -- the label Mitch Miller had kept rock free until only shortly before -- when they signed Paul Revere & the Raiders (and then bungled THEIR first releases). Columbia at that time was simply not set up to maximize the potential of an act like The Cryan Shames, which is why their subsequent singles that should have gone Top 10 ("I Wanna Meet You," "It Could Be We're In Love", etc.) didn't. In my estimation, The Cryan Shames' "Sugar and Spice" is one of the most emotionally effective records released in the '60s -- and 48 years later it still makes my heart soar every single time. It was the times, guys. Love was in the air, music was new and fresh, and an incredible number of children were coming of age, and convinced themselves that this feeling could change the world. Although it didn't play out that way, the sound you hear is sheer optimism … not yet damaged. When we think about "The Girl Groups" sound, we tend to be a bit more "vintage" in our thought process ... the girl groups sound dominated the '60's and has a very loyal following. So when we heard that Billboard Magazine was saluting The Top 40 Girl Group Records of All-Time, we couldn't wait to see the list. Ford produced two models of cars with acrylic roof panels, both called "Skyliners"; one in 1954 and another in 1955 and 1956. They then applied the Skyliner name to cars with retractable hard tops in 1957, 1958 and 1959. The group took their name in 1958. According to Jimmy Beaumont and Skyliners' manager Joe Rock, the group was named for the song "Skyliner", used as a theme by big band leader Charlie Barnet, so that's the story I wrote in the liner notes for the Skyliners' 40th anniversary CD on Collectables. However, original group member Jackie Taylor says that the group was named for the car. In an interview I did with him for "Soul Up North" Magazine, Jackie said that Joe was hoping that he could get cars for the group. It's true that a one-time viewing of 'A Hard Day's Night' in colour might interest me, but it could never surpass the black and white film. The original has the capability to transport me (and, I suspect, anyone else who grew up at that time) to those gritty, rain-sodden English streets all over again. Now, I understand from a monetary point of view that they might find it hard to resist cashing in on our penchant for all things new. However, I really believe that colourizing would alter the essential character of the work, just as colourized film noirs lose their ominous, moody cast when they are altered. Sorry, Kent, but I have to disagree with you on the merits of this one. Honestly, I wouldn't have really thought much about it had I not seen these colorized clips on YouTube ... to say the least, I was immediately intrigued. As a fan of the film, give these clips a once-over and see if you don't agree that it'd be pretty cool to at least have this available as an option. ON THE TUBE ... A 'replay' movie channel has shown this repeatedly this last week or so. I finally stopped to watch a bit and was pleasantly surprised. For those of your group that loved the Cruisin' series, I have an unreleased master of 1963 WKBW / Joey Reynolds that was done in the late 1990's or early 2000's that, because of clearance on the songs, has never seen the light of day. I wrote the liner notes for the release for Increase but we were never able to release it. I will have to try to find the master, as it was very well done, as only Joey Reynolds could have done! The best part of it is him interviewing Little Eva (Boyd) and it is hilarious! It's great seeing Pete Drake in the Top Ten in Chicago. He lived near us and had kids our age. We knew their dad was a studio musician, but there wasn't any hoopla when he did "Forever." These were just regular neighborhood folks. It's fun to read the WLS charts from fifty years ago! One song listed, I had forgotten about, was "Wonderful Summer" by Robin Ward. I absolutely LOVED it, and I was only eleven at the time, when it made the top ten! I guess I had a crush on her voice. The song was so romantic! Robin also went by Jackie, which was another stage name. Besides her one-hit wonder, she was known for Shirley Jones' singing voice in "The Partridge Family" and the Rice-a-Roni commercials. She's had a life-long body of work in the studio and has sung with zillions of the greats. I'd like to know what small town in Nebraska she was raised in, but can't find it anywhere. Here is a very interesting interview about her work in the business. "Bad Love" from Clapton's Journeyman album is just such a terrific piece of work on every level. Written with Mick Jones, from Foreigner, it embodies the over-indulgent times. Eric was going through his Versace - rock god status ... playing great and looking great. The video with Phil Collins on drums; Nathan East on Bass and Greg Phillinganes on keyboards is terrific. Great song; great video; great album! Thanks a lot for your thorough vetting of my 'questionable' trivia fact regarding 'Chapel of Love'. I hope you enjoyed researching that wonderful year of our musical expansion. I do know that one of my many CD inserts had stated the facts as I 'mis'-understood them. ha ha Someday I may find it and will forward it along to you. Well paraphrasing from one of my all time favorite movies "I Love You, Kent" (surely you will figure this out) When a young girl ask Wolfman Jack how old he is and he responds 14 she replies 'I love you Wolfman'. Thanks for the e-mail back in February(!) Kent, sorry it took so long to reply, and thanks for adding my comments to Forgotten Hits. Gary T., would be fun to exchange memories with you, I enjoyed your past story on Forgotten Hits about working with my Uncle Art at KIIS in LA, sounds like you guys had a nice friendship and mutual respect. The photo link is at the bottom of the page. This is the pictures that I was telling you about. Ed Sullivan in the center, with The Beatles around him; Ringo to the right (back to camera), George Harrison to the left, John Lennon farther to the left, with Paul McCartney hidden behind John Lennon (note the change of the collar line and left shoulder line of John Lennon). Other pictures from this show depict the differing outfits they had on, with John and Paul’s very similar. I think this was from one of their late / last appearances on the Ed Sullivan show. To the very far left, with clipboard (?) in hand and headset microphone on, our very own Uncle Art!! Standing two feet away from The Beatles, and looking a little bored?! Sorry to say I cannot remember where I got the following information from so just in case it was something you ran in Forgotten Hits, please accept my apologies for wasting your time with the following. The other day you mentioned Tony Hatch saying to you that "Downtown", in fact, was based and inspired by the Drifters' Hit "On Broadway". I read / or was told recently that the intro to Pretty Woman by Roy Orbison was based on Lucille by Little Richard! If you listen to them both there is no doubt in my mind. And that's why rock and roll music will never die! May 1, TOLEDO, OH - Over a dozen celebrities have teamed up with Ohio-based Veterans Matter to generate awareness about the issue of homeless veterans and to help raise funds that will decrease the number of unhoused vets on our streets. The campaign is supported by media giant Cumulus Media which is airing Veterans Matter celebrity-voiced public service announcements in 110 U.S. markets May 1 - 31, 2014. The thirty-second announcements, encouraging listeners to pledge support by texting “VETS” to 41444, are voiced by musicians Kid Rock, Kix Brooks, John Fogerty, John Mellencamp, Darius Rucker, Darryl Worley, Stevie Nicks, ZZ Top's Dusty Hill, Emerson Drive, Jennifer Nettles, Natalie Stovall and The Drive as well as author Mitch Albom. Veterans Matter, a national program of 1Matters, a 501 (c) 3 not-for-profit with roots back to 1990, was started by founder Ken Leslie in 2012, after learning that the biggest obstacle facing some 60,000 homeless veterans eligible for housing assistance was the lack of a rental deposit, which is not covered by the HUD-VASH voucher assistance program. “When you are working on the streets you see veterans beaten, robbed, even killed, yet if that happened behind enemy lines Americans would be outraged," explains Leslie. "Veterans Matters is just some regular Americans taking care of our own one at a time, just because we should, and because we can, everyone can." To date, Veterans Matter has housed 235 veterans, and veteran families, in six states. Partnering with the US Department of Housing and Urban Development (HUD) and Veteran Affairs (VA), Veterans Matter provides rental deposits for homeless veterans who qualify for voucher-assisted living but are unable fund the initial housing costs. With the outpouring of celebrity support and the backing of Cumulus Media, Veterans Matter has high hopes of being able to help house 1,000 more veterans in 2014. 100% of funds raised go toward the program. Very sad news this week as we lost Larry Ramos of The Association. Larry always stood out on stage ... there weren't a whole lot of Hawaiian Rock Stars back in the '60's!!! He will be missed. And I think you'll find this VVN piece very touching. I really enjoy seeing the surveys of other radio stations in other markets and in particularly what records made their surveys but didn't here in the OKC area. I always like to look up on you tube and find and play those songs which did make other markets but didn't make it here in OKC. It kind of makes me think about what songs I missed out on by them not charting here (or maybe I didn't miss out on them.) LOL! The one thing I immediately noticed about the surveys posted today in that the DJ's on WLS apparently worked every day of the week for some 2-3 hours on the average. Here in OKC, the DJ's worked some 4-5 hours a day Monday through Friday with some working a shortened air shift on either Saturday or Sunday. Back in the day before voice-tracking, I believe a lot of these jocks pre-taped their weekend shows during the week for airing over the weekend. I don't know that any of these jocks REALLY did live shows seven days a week ... but I asked Clark Weber what he recalled. As the morning man I only worked six days however and they ran church programs on Sunday ... however I recall that both Art Roberts and Ron Riley taped their 7th days. What I don't recall is if they actually taped a 7th day or it was an amalgam of stuff that was spliced together. Art Roberts recorded his Sunday night show during the week and called it a "Hootenanny" where he featured the likes of Winn Stracky, album tracks by Bob Dylan and other folk artists of the day and even played his banjo. I'm still a radio junkie, listening via my WiFi radio all across the nation to formerly award winning facilities decline into an embarrassment for a once proud industry. Depending on the radio group I tune in, the sloppy, noncaring programming of this group is more than I can take. It's unfortunate that some very good on air hosts must put up with the magnets for tune out, encouraging many like me to simply change the dial. All across America, one radio group above the others demonstrates over and over, they either have no programmers or they are not aware those who tune in to hear their favorite program also must endure the content in commercial breaks. I saw it coming a few years back when I received an inquiry of my availability to program a major market facility. Explaining to the president of the company that I could not accept a position to program again without total control of all programming. It was when he understood that included all commercial content too, that he responded “that's not programming's responsibility John, that's sales”. I replied, “oh, so the listeners don't hear that huh”. Tuning into this groups stations, one can not listen for a full hour without enduring what would have sent most program directors in the past rushing to make sure it didn't happen again. Not only does this group have very little paid commercial content, they “fill” those vacant slots with the exact same dozen public service announcements, aired on all of their stations nationally, with the exact same one airing up to three times in a single hour. The repetition alarm once understood to create tune-out, is totally ignored by this group. Even worst, “filling” a commercial break, all four minutes of it, with a monotonous 15 second bumper played over and over. On a regular basis, two units at the same time are programmed, ten second drop in's collide with a host returning to the air. Not to forget the exact same newscast running time and time again. It goes on and on with this group that demonstrates it has little if any programming guidance available or they simply don't consider programming of importance. They consider their stations as distributors of commercial content, they pay little attention to any programming, including over all content. Regardless of ones feelings about the radio industry today, it's interesting to me that in programming, this groups competitors very seldom have similar problems. I also find both CBS radio and Clear Channel pay attention to programming suggestions. Of course both CBS and Clear Channel headed up by two with major experience as programmers, Dan Mason and Bob Pittmann, understand it all begins with programming. It's unfortunate that the “dog” in the industry, Cumulus Media, either has no programmers or just simply don't care they are an embarrassment to radio. I'd almost forgot those days when a WLS sales department found need to produce a video about their program director. I think you'll agree with her after reading this article. Honestly, all she's saying is exactly the same thing WE'VE been saying for the past fifteen years ... but it goes on to prove two of my on-going points. Give the next generation(s) a chance to discover and fall in love with this music and they will ... it's timeless, infectious pop that could live on forever, if only given the chance. And the fact that even a "newbie" is disgusted by the complete lack of respect radio holds for its listeners shows you just how far this situation has truly deteriorated. Thanks, Bob, that means a lot ... and on THAT up-note, we're outta here!!! Be sure to check the web page next week for more concert reviews. Enjoy the rest of your weekend! It's our biggest Saturday Surveys Feature Yet!!! 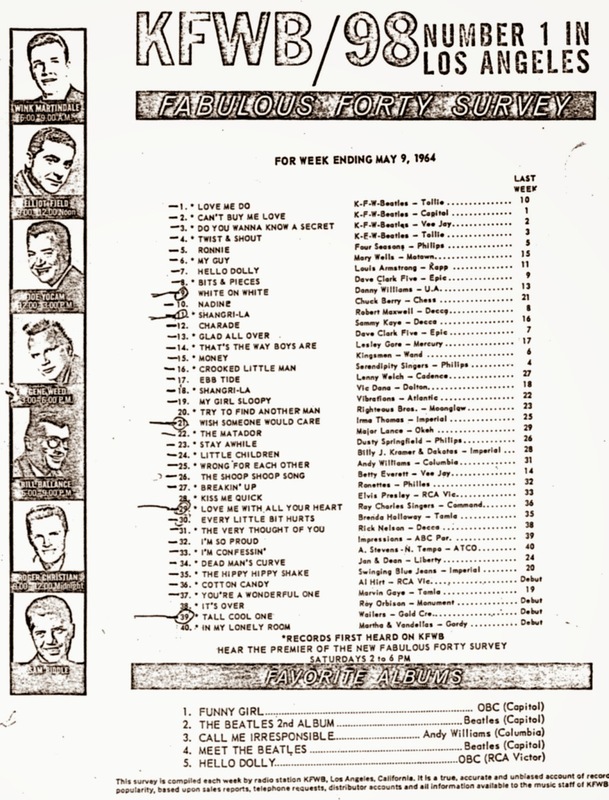 Four charts from 1967 to kick off this week's edition of The Saturday Surveys ... featuring our first May Charts. 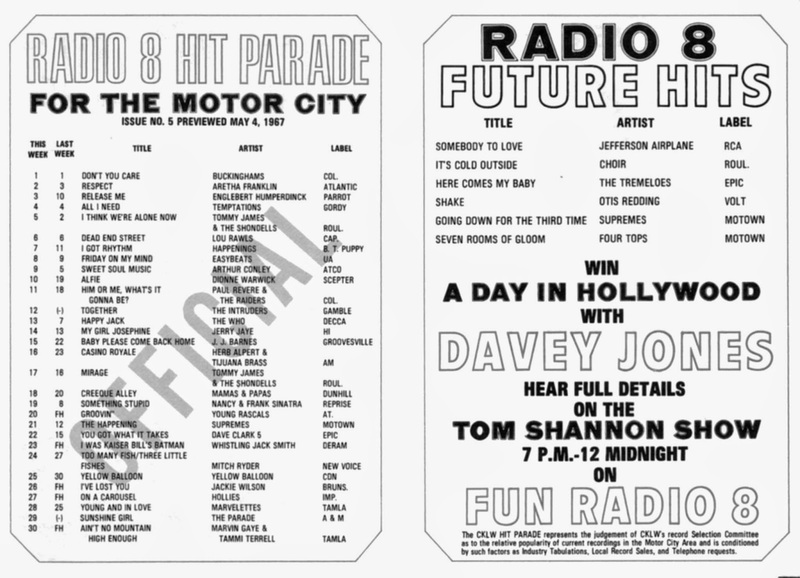 Describing itself as playing The Hit Parade "For The Motor City", the station actually broadcast out of Windsor, Ontario, Canada. With their 50,000 watt signal, they were a favorite amongst teens growing up on BOTH sides of the border. Another Forgotten Hit favorite of mine sits at #14. 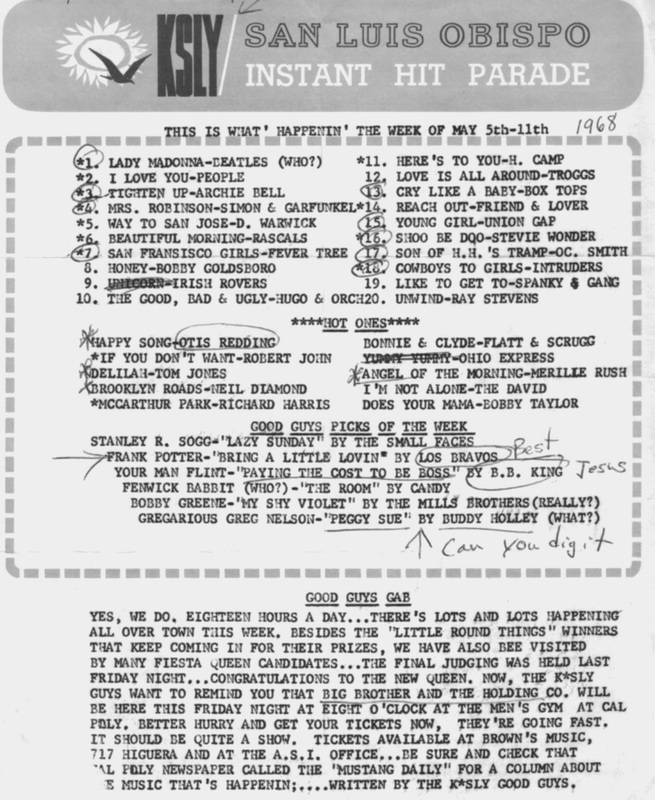 It's the Jerry Jaye remake version of "My Girl Josephine" ("Hello, Josephine"), the old Fats Domino tune. Neat to see this Canadian station giving away a day in Hollywood with Davy (Davey?!?!) Jones. The Monkees were at their peak at this time ... but you won't find them on this chart. 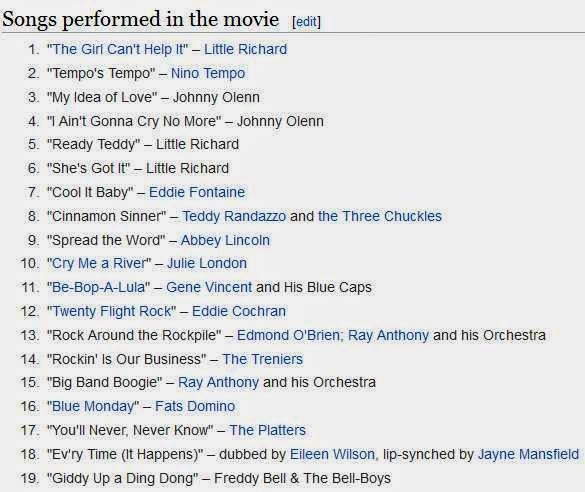 Here we find our FH Buddy Davie Allan and the Arrows topping the charts with his '67 Instrumental Smash "Blues' Theme" ... and The Buckinghams are nowhere to be found! Instead we get more of the pre-Summer of Love California sounds like "My Back Pages" by The Byrds, "Can't Seem To Make You Mine" by The Seeds, "Somebody To Love" by The Jefferson Airplane, "Sunshine Girl" by The Parade and "Creeque Alley" by the transplanted Mamas and Papas. 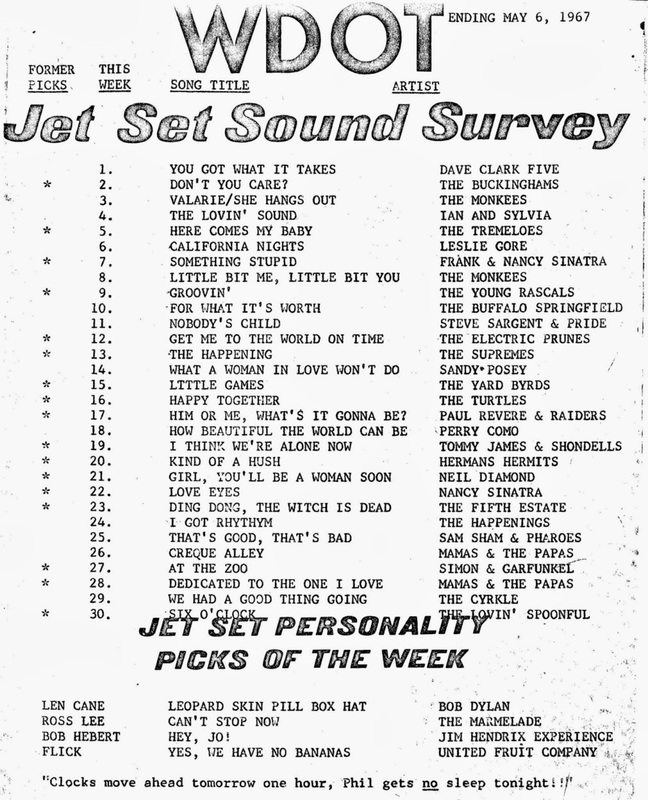 The Dave Clark Five only managed a #22 showing this week on the Detroit chart ... but were locked in at the #1 spot on The Jet Set Sound Survey coming out of WDOT (in Burlington, Vermont!) this week in '67. Look closely and you'll find lots of great 1967 Hits on this chart including the latest sounds from hip, popular artists like The Tremeloes, The Young Rascals, The Buffalo Springfield, The Electric Prunes, The Yardbirds, The Turtles, Paul Revere and the Raiders, Tommy James and the Shondells, Herman's Hermits, Simon and Garfunkel, The Mamas and the Papas and ... Perry Como (?!?!?) Huh?!?!? 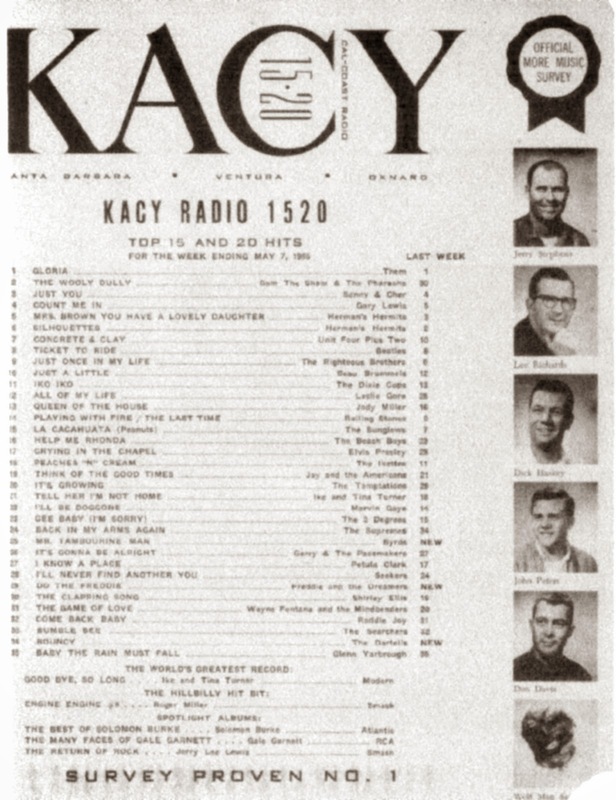 And finally, KYNO, another "Boss Radio" station (from down the road a piece ... in Fresno, California), shows The Young Rascals on top with their hit "I've Been Lonely Too Long", a bit ironic in that all of the OTHER charts featured from this week in 1967 show their current hit as "Groovin'"!!! "Don't You Care" is listed as a "moving up" premier ... as is "A Day In The Life Of" (Of?!?!?) by The Beatles, a full month BEFORE "Sgt. Pepper's Lonely Hearts Club Band" would be released! You'll still find many of the hot California sounds listed above on our other West Coast Chart ... only this time they're joined by the hits "Yellow Balloon" by Yellow Balloon and "Live" by The Merry-Go-Round. A glance at these four charts ... all from the exact same week in 1967 ... will show you why the national charts RARELY reflected what you were hearing in your home town ... which is why so many of us remember things differently, growing up listening to the radio in the '60's. We venture back to Chicago for this survey from May, 1972, where Sonny and Cher top the chart with their unlikely hit "A Cowboy's Work Is Never Done". 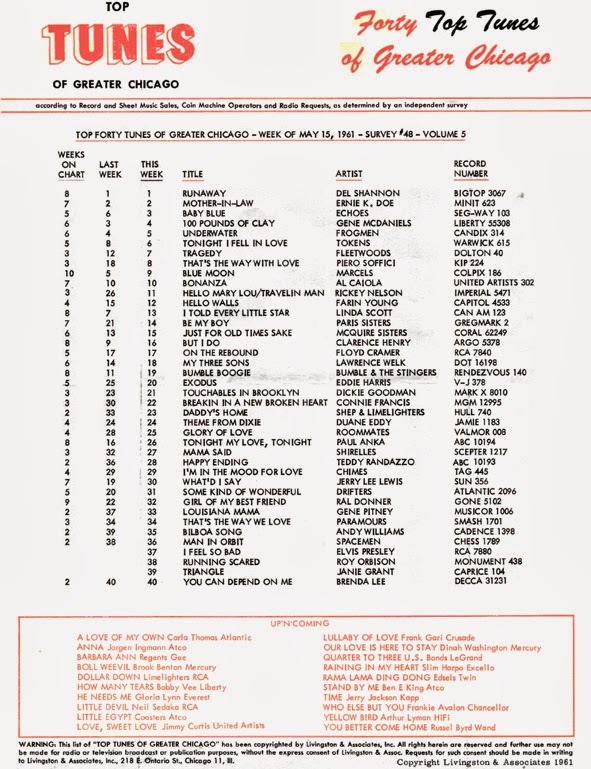 The 'CFL chart was always fun to look at for their "themed" Top Tens ... notice this week (for "May Day" Gold) they're featuring songs and artists built around a theme of flowers. Here's something you don't see everyday ... "Gloria" topping the charts ... by THEM!!! Herman's Hermits have back-to-back hits with "Mrs. Brown, You've Got A Lovely Daughter" and "Silhouettes" at numbers 5 and 6 respectively, just ahead of The Beatles with their latest, "Ticket To Ride". It's also kind of cool to see Fever Tree in the Top Ten. But I especially like the deejays' pick hits of the week ... and the commentary that follows. Stanley R. Sogg picks "Lazy Sunday" by The Small Faces ... WAY before anybody knew who these guys were. Frank Potter likes "Bring A Little Lovin'" by Los Bravos, their follow-up hit to "Black Is Black" ... while Your Man Flint has selected a B.B. King track, "Paying The Cost To Be The Boss." Fenwick Rabbit (who?) likes "The Room" by Candy; Bobby Greene likes "My Shy Violet" by The Mills Brothers (really?) and Gregarious Greg Nelson gives the nod to "Peggy Sue" by Buddy Holley(sic) What?!?!? And proving yet again that it didn't really matter WHAT year it was, here are The Beatles, topping the charts again in 1969 with their two-sided hit "Get Back" / "Don't Let Me Down". Leaping from #12 to #1, they replace fellow Apple Recording artist Mary Hopkin's hit "Goodbye" (a Paul McCartney tune) ... wonder how many people out there remember THAT one! Other HUGE leaps up the chart this week include Henry Mancini's "Love Theme from 'Romeo And Juliet'", jumping from #30 to #2 and "Oh Happy Day" by The Edwin Hawkins Singers, who leaps from #29 to #3! Tommy Roe's in The Top Ten with "Heather Honey". 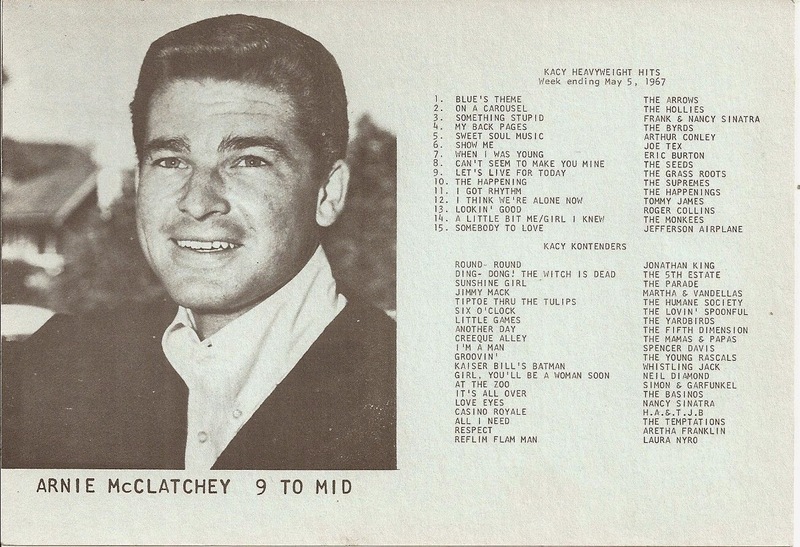 So is Andy Williams with the mis-spelled "Happy Heart", sitting at #8. 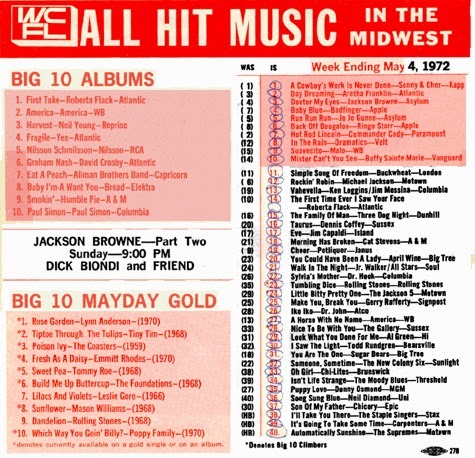 And check out the action on the brand new Three Dog Night hit "One", climbing from #45 to #9 in just one week! I also like this weeks "Hit Bound" song, "I Can't Quit Her" by The Arbors, applying the same treatment they used far more successfully on "The Letter" a few months earlier to this vintage Al Kooper / Blood, Sweat And Tears tune.